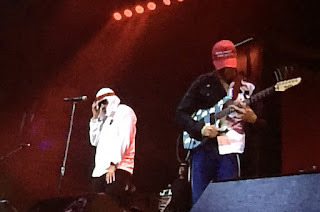 JP's Music Blog: Concert Review: Prophets Of Rage Stopped At Mohegan Sun To "Make America Rage Again"
Concert Review: Prophets Of Rage Stopped At Mohegan Sun To "Make America Rage Again"
The politically-charged supergroup, Prophets of Rage are making their way across the U.S., spreading the word "Make America Rage Again." The band, consisting of members of Rage Against The Machine, Public Enemy and Cypress Hill, came together under the threat of a new, unworthy president. By not agreeing with either candidate, Prophet of Rage are trying to bring the power back to the people, which is exactly what happened last Sunday night at Mohegan Sun. Just before 9pm, DJ Lord, from Public Enemy, took up residency behind his two turntables and a microphone, getting the audience to stand to Jimi Hendrix's version of the "Star Spangled Banner." Then for the next 15 minutes, DJ Lord would mix together songs from Beastie Boys and Run DMC to James Brown, Nirvana and Metallica to get the crowd pumped before an air raid siren signaled the arrival of Prophets of Rage. As soon as they hit the stage, the energy was through the roof, beginning with their original song "Prophets Of Rage." As soon as the first notes of the Rage Against The Machine song, "Guerrilla Radio" were struck, the fans on the floor began jump turning it into a wild sea of people. Throughout the evening, Prophets Of Rage mixed in Public Enemy songs ("Miuzi Weighs A Ton") and Cypress Hill songs ("(Rock) Superstar"), along with the energy of Rage Against The Machine songs ("Take The Power Back" and "Testify"). The hip-hop pinnacle of the evening came about when Chuck D from Public Enemy and B-Real from Cypress Hill went out into the audience reciting a medley of their most famous songs like "Insane In The Brain" and "Can't Trust It." B-Real would introduce "Calm Like A Bomb" as being performed for the first time on this tour, before guitarist Tom Morello paid tribute to Eddie Van Halen with his version of "Cathedral." The energized crowd shouted out the chorus of "Know Your Enemy," before Prophets of Rage went old-school with their cover of the Beastie Boys "No Sleep 'Til Brooklyn." The place exploded with the two closing numbers, "Bulls On Parade" and "Killing In The Name" as fans seemed exhausted from the 100 minute set as they exited the arena. At one point during Tom Morello's solo, he flipped his guitar over to show a hand written sign readng "NOBODY FOR PRESIDENT" and with that statement, I hope that we can all "Make America Rage Again."